Many children have spiritual experiences but do not talk about them. They are often frightened of being regarded as "strange" and being laughed at or embarrassed. But no one should feel uneasy about having a mystical moment or a feeling of oneness with the world. Children should be encouraged to share when they have had an amazing dream, a sudden insight or epiphany, or a vision. And this means that parents, relatives, and friends of children need to show them that they cherish and respect their spirituality. A new movie asks us to do just that.As most people know by now, the book Heaven Is for Real is a huge bestseller that has sold over eight million copies. The movie version already has a built-in audience, especially among conservative Christian audiences who have flocked to support its literal descriptions of heaven. But we think the movie has a broader audience appeal when it is seen not as proof of a physical place called heaven ("as real as the earth and sky," as one character puts it) but as an exploration of children's spirituality.Patricia Bostelman, the vice president for marketing at Barnes & Noble, put her finger on one of the reasons for Heaven Is for Real's incredible success:"When you buy the religion subject, you are presented with many stories about heaven, personal experiences about near-death and the afterlife. But what was unusual about this book was that it was a story about a little boy. It deactivated some of the cynicism that can go along with adults capitalizing on their experiences. "Todd Burpo (Greg Kinnear) lives in a Nebraska farming community. He installs and repairs garage doors, coaches the high school wrestling team, is a volunteer fireman, and is the preacher at a Wesleyan church where he is known for his down-to-earth sermons. His wife Sonja (Kelly Reilly) leads the church choir and looks after their daughter Cassie (Lane Styles) and four-year-old son Colton (Connor Corum).Todd is having a bad year. He breaks his leg sliding into third base during a baseball game and then goes through a severely painful case of kidney stones. Even more stressful is the family's financial difficulties; often trading his work for contributions to the church, Todd just doesn't make enough to pay all their bills. Yet when his friend (Thomas Haden Church), the local banker and a church board member, offers him a loan, he won't take it.On a family trip, Colton becomes very sick. Todd and Sonja rush him to the hospital where the doctors tell them the boy's appendix has ruptured and he requires immediate surgery to save his life. While Todd turns to God in the hospital chapel, Sonja calls church members and asks for prayers. Colton survives and recovers.A short while later the sensitive little boy begins telling his father what happened to him during the operation. He rose out of his body where he could see the doctors operating on him. He saw his father shouting at God in one room and his mother talking on the phone in another. Angels sang to him and he went to a beautiful place he knew was heaven. There he sat on Jesus' lap and met his grandfather and his sister who died in a miscarriage years ago. He learned that "We don't ever have to be scared. "Colton's accounts of this spiritual adventure prove to be very upsetting to Todd. He does some computer research on near-death experiences, even though the hospital records show that Colton did not die even for a moment. (Download Heaven Is for Real) He visits a psychology professor at the university (Nancy Sorel) who suggests that maybe Todd is questioning his own faith while attempting to explain something that goes beyond the rational. Has he been upstaged by his son's genuine spiritual experience?When Todd talks about Colton's visit to heaven in church, more doubts come to the fore. Some church members are intrigued, others are worried that their community will become a circus once word gets out to the media, and others are offended that their church might become a place where people check their brains at the door. One board member (Margo Martindale) even suggests they may need to find a new minister. When Sonja asks, "Why can't this just be a mystery?" Todd replies, "Why does heaven have to be a myth?" Randall Wallace directs this spiritual drama. He and Chris Parker adapted the screenplay from the bestselling book by Todd Burpo and Lynn Vincent. Two major factors help make Heaven Is For Real an affecting and illuminating story about faith and the afterlife. First, the screen version is refreshingly free of any heavy Christian fundamentalism overlay; this story becomes one that even those who consider themselves spiritual-but-not-religious can appreciate. Certainly, it is not that different in appeal from other movies about heaven, angels, and the afterlife (see our gallery). 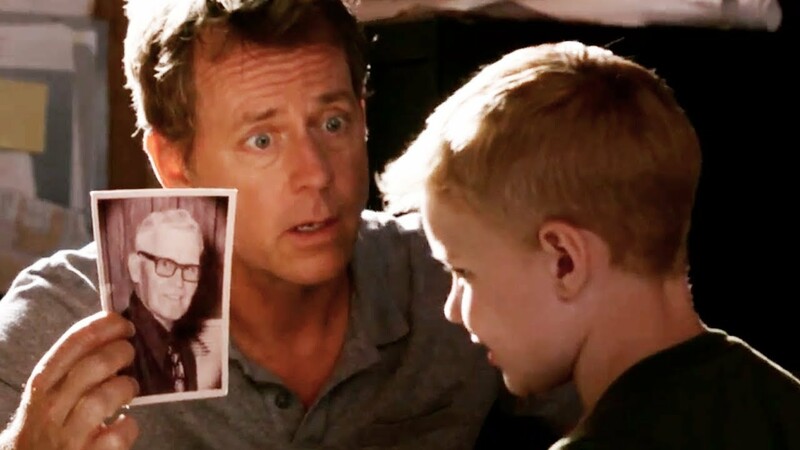 (Download Heaven Is for Real) Second, Wallace made wise choices in casting Greg Kinnear as the troubled but loving father and Connor Colton as the four-year-old-kid who talks of being in Heaven. They convey this father and son's natural affection, trust, and loyalty, drawing us in from the first scene of them together and not letting us go until the closing sequences of the film when Todd discovers a YouTube video of a girl in Lithuania's paintings of her own visions of heaven, and Colton proclaims that she's got the picture of Jesus just right. Is heaven for real? The movie leaves the answer open. More mysteries abound! Talking to children, adults are often surprised to discover their interest in spiritual matters. Children are often able to rip away the wrappings and reveal the real treasures within. As spiritual writer Gerald May put it:"We must trust that God's activity in these small lives is not dependent upon our interventions. God has indeed been present with these little ones all along, and with just a little bit of encouragement, the children will gradually share that presence with us. "Jesus startled his disciples when he told them and others that they had to become like children before they could enter the kingdom of God. Children live in the present moment and delight in goofing around — Colton loves to belt out "We Will Rock You. "Earlier cultures and religions demonstrated a high regard for the spiritual capacities of children. The ancient Greeks initiated certain special children into the secrets of the Eleusinian mysteries. (Download Heaven Is for Real) In Tibet (as we have seen in such movies as Unmistaken Child and Yangsi) when a lama or Rinpoche died, a search was instituted for the child who is his reincarnation.The Albigenses, a Christian sect in France during the 12th and 13th centuries, regularly queried children about their visions and prophecies. And during the past two centuries, the Catholic church has charted the experiences of youth who have reported visions of the Virgin Mary along with various instructions and warnings.